Pair jailed for a total of six years after being caught growing the drug in Dundee. 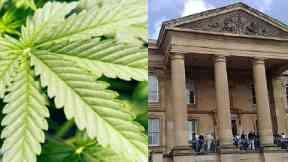 Dundee: Two men jailed over cannabis farm. Two drug dealers who ran a £60,000 cannabis farm at a house in Dundee have been jailed for a total of six years. Kim Bao Liu, who was caught growing cannabis at an "industrial scale" cultivation in the city's Ladywell Avenue, has been jailed for three-and-a-half years. Co-accused Chung Chan Wang has been jailed for two years and four months for his part in helping Liu sell the drug on. The pair were handed the sentences after a sheriff told them they were "causing misery in our community". Giving evidence during the trial at Dundee Sheriff Court DC Gareth Ewing, of Police Scotland, said the drug was being produced for distribution "on a national level". Liu had been living in the house for months before police raided the property, where they found a sophisticated cannabis growing setup, with power packs, bags of soil, water pumps and sprayers. Despite his DNA being found on some of these items, a gas man identifying him as living in the house and him being found with a key to the front door when police stopped him, the 55-year-old denied having anything to do with growing and supplying the drug. Fiscal depute Eilidh Robertson told a jury: "You may think that Kim Bao Liu is unluckiest man in Dundee or you may think, as the Crown would invite you to, that all this evidence stacks up to one obvious, common sense conclusion." Liu, described as a prisoner at HMP Perth, denied charges of producing and being concerned in the supply of cannabis between April 29 and August 29 last year. The second man, 31-year-old Wang, also a prisoner at Perth, pleaded guilty to being concerned in the supply of cannabis. On sentencing the pair Sheriff Tom Hughes said: "This court considers this to be a serious case. "The purpose you were both engaged in is illegal and for good reason because of the difficulty and misery that this causes to our communities."